Char Dham Yatra includes the marvelous four holy shrines whose collective visit can wash away all the sins of a person. There’s a Yatra known as Badi Char Dham Yatra and there’s another known as Chota Char Dham Yatra. The season of the Holy journey falls between May to October. There are four Abodes in the Himalayas situated within the Garhwal region of Uttarakhand state in North India and are collectively referred as “Chota Char Dham of India which includes four holy shrines of the Hindus: Badrinath, Kedarnath, Gangotri, and Yamunotri. Each of the sites is dedicated to different Hindu deities. In Kedarnath, people worship Lord Shiva while Badrinath is dedicated to Lord Vishnu. On the other hand, Yamunotri and Gangotri are dedicated to Goddess Ganga and Yamuna rivers respectively. It is believed that every Hindu should complete the Char Dham Yatra at least once in their lifetime. The Spiritual Char Dham yatra begins from April-May and continues till Oct-Nov each year. 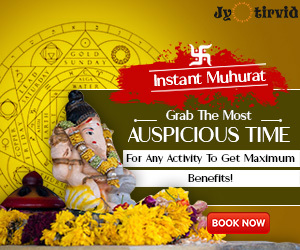 April to June is the best time for Char Dham Yatra, as you can enjoy the scenic beauty of the environment with most comfortable weather and climate. Traditionally Chardham Yatra starts from west to east in Clockwise Direction, this means the yatra starts from Yamunotri, proceeding to Gangotri, Kedarnath and then terminates at Badrinath. All these four holy places Badrinath, Kedarnath, Gangotri, and Yamunotri have their own Significance, Legends, Mythology, and history. 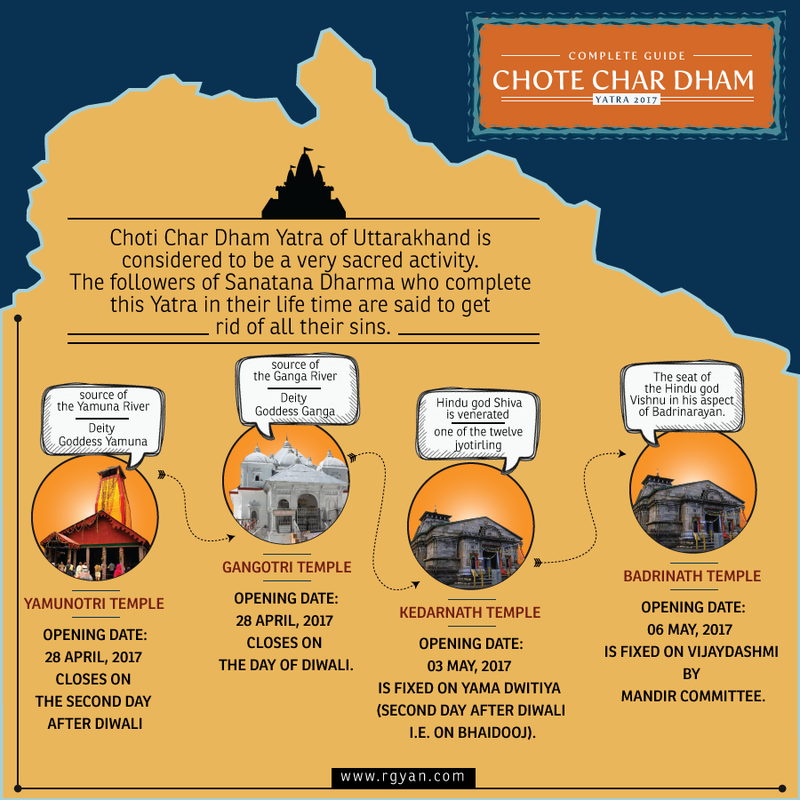 Below mentioned are the complete roadmap and the timings of the entire Uttaranchal Chota Char Dham Yatra. Follow the series from first to end according to the details. You will get to know all the details of each temple starting from the deity worshiped to the rituals followed. You can also find an extensive guide to reach these holy places. Closing date: The temple closes on the day of Diwali. Yamunotri is the original source of Yamuna River surrounded by lofty peaks forest and large valley. The Yamuna is the second largest and one one holiest river in India after Ganga. It is part of the four holy abodes in Chardham pilgrimage Yatra. Pilgrims also get to enjoy a number of hot water springs in the vicinity of the temple. Yamunotri is located at an altitude of 3293 meters above sea level, in the Garhwal Himalaya about 40 km away from Barkot in Uttarkashi district of Uttarakhand. The actual source of Yamuna River lies in the Yamunotri Glacier at a height 6,387 meters near Bandarpunch Peaks in Lower Himalayas. 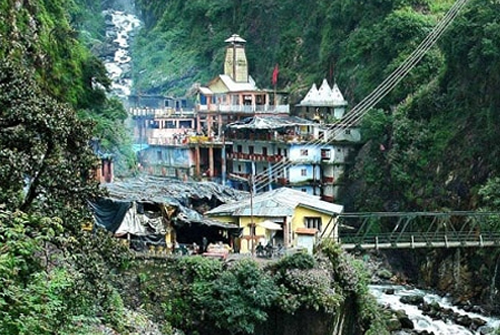 The Yamunotri temple is dedicated to goddess Yamuna, the main Deity of the temple is made up of Black marble. Yamunotri temple was built by Maharani Gularia of Jaipur in the 19th century after the Temple has been destroyed by Climate. The Yamunotri Shrine was originally constructed by MaharajPratap Shah of TehriGarhwal on the left seashore of Yamuna River. According to Hindu mythology, It is believed that the Yamuna is the daughter of Surya the Sungod& the sister of Yama, the god of death. After crossing Yamuna bridge the road goes through Nowgaon. From Nowgaon the road divides in two, the right side road goes to Yamunotri and the left side road goes to Sankri. Nawgaon is at a distance of 171 KM from Haridwar. The trekking to Yamunotri starts from Hanumanchatti. In Char Dham Yatra, trekking is required for Yamunotri and Kedarnath temples, whereas Gangotri and Badrinath Dham is well connected by road. Out of the two trek routes, Yamunotri is difficult one if compared with Kedarnath trek. It will take 6 hours for a normal trekker to cover this hill road. The last half kilometer is of high elevation and most beautiful stretch of the trip. The distance of Yamunotri temple from Haridwar is 279 KM including 14 KM of a trek in the last phase. Gangotri is one of the origin sources of Holy River Ganga (Ganges), and one of the important Char Dham pilgrimage in Hindu Religion. The main origin of the river is “Gaumukh” which is a glacier located 19 km away from Gangotri temple. Ganga River is the longest and most sacred river in the world. Gangotri is located at an altitude of 3100 meters above sea level, on the banks of Bhagirathi river. Gangotri is the starting point of Ganga river where the goddess Ganga worshiped by the Pilgrims or Devotees. In Ancient time the river is called Bhagirathi and attains the name Ganga from Devprayag onwards where Bhagirathi meets with Alaknanda from Ganga River. Gangotri is the home place of many ashrams, small shrines, and temple. The Gangotri temple opens on the auspicious day of AkshayTritiya which falls in the month of May and closes down on Yama Dwitiya or BhaiDuj which falls in the month of November. Gangotri temple remains closed for the rest of the six months when the deity is worshiped at Mukhwa, near Harsil. It is the birthplace of Ganga, one of the holiest rivers for the Hindus and the main river that is meant to give life to mankind, purify mankind. The religious significance of Gangotri could be associated with its many mythical connections. It is believed that the waters of River Ganga flowing at Gangotri contain in it a powerful nectar by means of which Lord Shiva’s throat was soothed and healed after he had gulped poison. Pilgrims strongly believe in this and thus come in large numbers from far and wide to carry back with them the holy waters of River Ganga which is then used for worshipping Lord Shiva. To reach Gangotri you need to pass from Uttarkashi to Gangotri through many hills. Usually, it takes 5 hours. Most of the time while traveling towards Gangotri, river Bhagirathi will be on your right. Gas stations open at 6:30 in the morning and after 8 PM driving is not allowed in the hill roads. Kedarnath temple is one of the sacred pilgrimage centers in Northern India, located on the bank of Mandakini River at an altitude of 3584 meters above sea level. The historical name of this region is “KedarKhand”. Kedarnath temple is a part of Char Dham and PanchKedar in Uttarakhand and one of the 12 Jyotirlingas of Lord Shiva in India. Kedarnath is flanked by breathtaking snow-capped peaks, making it the most remote site among all four Char DhamShrines. But each year the followers of Lord Shiva visit this holy temple. The scenic beauty of Kedarnath town attracts lots of tourists from all over the world. You will find it quite crowded during the summer season (May and June). In the month of April to August thousands of devotees come to visit the Kedarnath Temple. 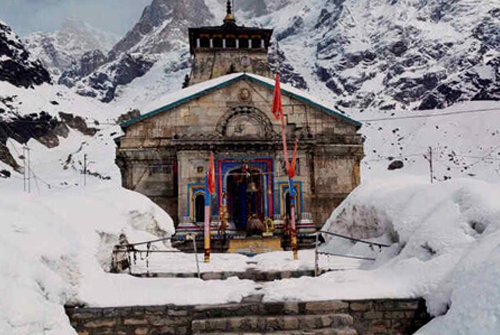 During Winter season, Kedarnath is closed for six month due to Heavy snowfall and Extreme Cold weather. Renowned temple Kedarnath is dedicated to incarnations of Lord Shiva. Kedarnath is named after King Kedar who ruled in the Satya Yuga. It is believed that KedarnathDham is the place where Lord Shiva absolved Pandavas from the sin of killing their own cousins Kauravas in the battle of Kurukshetra war. There is an interesting Story behind the Town and its temple. According to the Puranas, the Pandava brothers did a major penance in Kedarnath to please Lord Shiva. Earlier the temple was built by Pandavas and the present temple was built by AdiShankaracharya. Just Behind the temple you will seensamadhi of AdiShankaracharya. 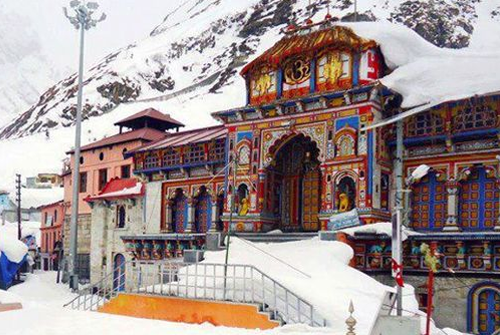 Badrinath is one of the holy shrines for Vaishnavites among the 108 divyadesams incarnation of Lord Vishnu. Badrinath town is also the part of PanchBadri temples including YogDhyanBadri, BhavishyaBadri, AdiBadri and VriddhaBadri, along with Badrinath temple. Badrinath temple is located at an altitude of about 3415 mts above the sea level in the Chamoli District of Uttarakhand. The temple is located in Silent valley of Garhwal Himalayas on the seashore of flowing water of Alaknandariver. Everyone heared about the marvellousor stunning beauty of Badrinath town, with pleasant weather, dense forest, snow clad Mountains, holy river with surrounding green valley which attracts tourists from india as well as from abroad. 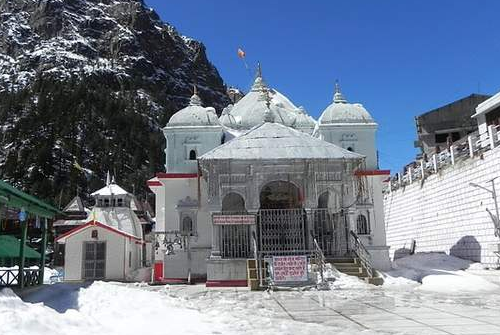 Although Badrinath temple was built by the AdiShankaracharya, who initially discovered the Badrinarayan idol in the Alakananda River and installed it in hot water spring of TaptKund. Present temple was built by King of Garhwal in 16th century. Ornament Stones, Impressive traditional carving, Pillars Design is the first features to strike lots of devotees visually. The Archectiture appearance of the Badrinath temple is similar to the appearence of Buddhist Vihara temple. According to legend it is believed that At the time of Satyayuga , Lord Shiva meditated here for thousands of years when Goddess Lakshmi provided shadow over her husband in the form of a Badri tree. So the place came to be known as name of Badrinath. Actually, the whole valley encompassing Kedar-Badri was the home of Lord Shiva. It is one of the reason that, The Temple is flooded with devotees during mahashivratri Festival as well. At the entrance gate of Badrinath Temple, main idol of Lord Shiva is Placed on Bird Garud, the vehicle of Lord Badrinarayan. When you will enter the main Sanctum you will find mediated AdiShankaracharyaMurti. 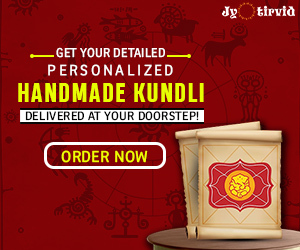 You will find many images of gods namely Kuber, Sridevi and Bhoodevi as well as the sages Nar, Narayan, BhaktaNarada all are seated around the main Deity of Lord Shiva. There are many shrines in and around the temple such as Goddess Laxmi, Hanuman, Narsimha, Nar-Narayan, GhantaKarna and an AshtabhujaGanesha. The diety of Badrinath temple is made of black stone shaligram. By Bus: Badrinath is easily accessible by road. It is located at a distance of 525 Km from Delhi & 296 Km from Rishikesh. There are regular buses operating to Badrinath from Delhi, Haridwar, and Rishikesh. Regular buses operate from Rishikesh bus station to Badrinath and start very early before dawn. The last bus from Rishikesh leaves for Badrinath before dawn. The road is narrow after Joshimath and travel are not permitted on the road after sunset. Therefore if one misses the bus for Badrinath at Rishikesh bus station, one has to go only up to Rudraprayag, Chamoli or Joshimath and spent the night there to take the early morning bus for Badrinath from that town. According to the puranans of Sanatana Dharma, the Hindu followers are said to get rid of all their sins on completing this sacred trip of Chota char Dham yatra in Uttaranchal. For more updates, please subscribe our newsletter. Thanks for sharing the valuable information about the chardham yatra . Very few lucky ones get a chance to visit these. It is very helpful information about the Chardham Yatra.